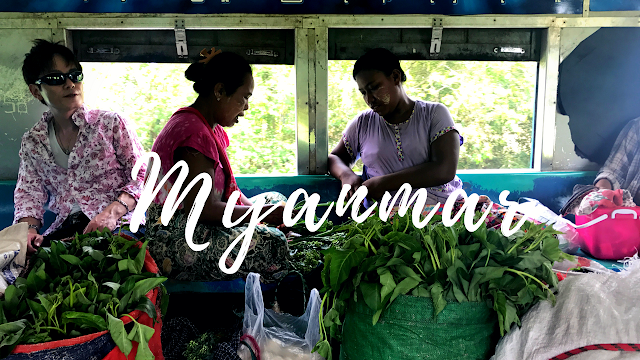 If you’re in Yangon, and you have 3hrs to spare, the Yangon Circular Railway is a must do! It takes you full circle around from the city into the suburbs of Yangon. The train runs in 2 directions, clockwise and counterclockwise. After breakfast, I took a cab to the station to make it just in time for the train at 10:45am. The circular railway departs from platform 7, so just take the overpass to the end and the last platform will be #7, it’s clearly marked. On the platform, you’ll see the ticket offices selling the tickets at 300kyat each, it’s the same price for locals and foreigners. The train was already at the platform, and it is pretty on time in terms of departures, so you’ll want to arrive early. All of the carriages on the end were full of tourists, so I ran ahead to the middle section to sit with the locals. Trust me, you’ll want to do this, the experience is pretty amazing. There was a lack of doors on this train, good thing it goes around 15km/hr. As I stepped onto the carriage, I noticed a signage on the stairs. It said Osaka Japan, Kinki Sharyo 1975. This is a Japanese manufacturer or railroad vehicles, including the Hong Kong MTR trains, Boston’s MBTA trains, LA’s Metro, Seattle’s Sound Transit Central Link Light rail, and of course the Shinkansen and other trains in Japan. But what is this train doing in Myanmar? Apparently back in 2012, a Japanese agency began a collaboration with Yangon City Development Committee to improve its public transport systems. This railroad will soon be archived into history, so better visit it before 2020! We left right on time at 10:45am, slowly chugging on the tracks. There were maybe 10 people on the train with me? But as we stopped at each station, more people got one. One couple had a carrying pole/shoulder pole with 2 buckets of bananas, a man came on with a basket tied to his neck and started making and selling beetle nuts on the train, others came on board with children. At some stations, people were rolling mysterious big white bags of unidentified objects.. they seem light so perhaps some sort of cotton or linen material for sale? At this point, not many people were selling or interacting with each other. We were soon in the suburbs, passing by small villages and farmlands. At the very Northwest of the track, just before you make a right bend, we pulled into Danyingon station. That station is something of its own. We started slowing down onto the tracks. There was a huge crowd of people, and probably a life time’s worth of veggies on would take. The train slowed down in place, and before it even made it to a complete stop, people started jumping on. Veggies came pouring in through the doors, the windows, all directions! After only a brief 5 minute stop, the train was completely loaded with veggies, there was zero floor space. The veggies (and its’ owners) stayed onboard for most of the remainder of the journey. Maybe a handful of people would get on and get off at each station. One lady came on with a big metal circular tub on her head full of donuts, mmmmm. At this point, everyone on the train was interacting with each other. Some working together bundling up vegetables, some just chatting with each other, others bought fresh produce or snacks from one another. It is so nice to see people supporting each other, it’s such a nice community, very different from sitting on subway trains in a major city. In big cities everyone seems so distant and disconnected, heads down reading their phones all day. I finished off my journey close to 2pm. Maybe it was the heat, or how relaxed I was, I didn’t get hangry. I got a cab back to my hotel and had a late room service. The rest of the afternoon was really lazy, with a massage and some reading by the pool. 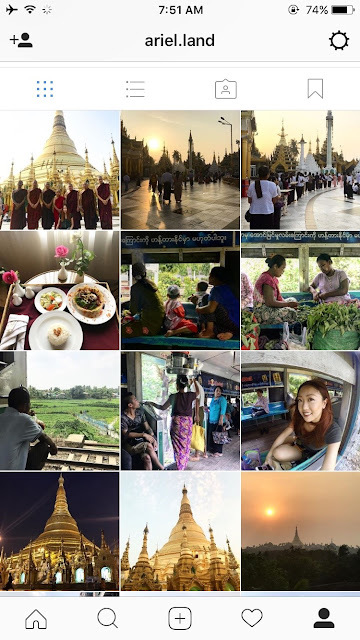 The next day I planned to wake up at 4:30am in the morning so I could catch the sunrise at Schwedagon Pagoda so I thought I’d get some good rest. This is already covered in my previous blog post about Yangon city. All in all, Yangon was a lovely city, and a great weekend away. Although it is a part of Indo China, it feels nothing like India or China, or Thailand in fact. I’ve finished off most countries in greater Indo China now, and each has their own charms: Vietnam with it’s beautiful Sapa rice valley in the north, beaches along the coast, and limestone formations and caves in Halong Bay; Thailand’s amazing cuisine, lovely islands and beaches; Cambodia’s precious Angkor Wat ruins; Malaysia’s Cameron highland tea plantations and colorful mix of religions; and Laos pending on my travel plans. Stay tuned, and check out my Instagram @ariel.land for live updates!